The surprise move by the Swiss Central Bank indicates that there are some players who are getting tired of this currency war. This war only robs the average person; it means the harder you work the less you earn because central bankers simply want to inflate the money supply. Watch China suddenly come out swinging and pull a move similar to the Swiss. The press is full of stories stating that China is trouble and that Russia is dead; the sheer volume of these stories is truly unbecoming and indicates a hidden agenda. Let us remind everyone that even though the USA remained the number one power for so long, the rise was not smooth. We had multiple corrections and failures along the way; the most severe of which was the great depression. So the stories they are pumping about the boom in China being over is total and utter rubbish. As expected, the EU central bankers decided to embark on their QE. So the new moral is print till you die. Notice it is the old masters that are doing this, USA, Japan and now Europe. It is these same old masters that are uniting instead of forming strong relationships with the new emerging powers. You can never fight the trend; you can delay it sometimes but never fight it; those that try to fight always get smashed. The trend is clearly in; the old masters are going to lose their status, and the new players are going to lead. Now Denmark is desperately trying to keep its currency under control. The Euro, Yen and Dollar are in a massive race to the bottom and the other currencies like the Canadian dollar, the Australian dollar; the British Pound, etc. are also actively pursuing the same policy. We call this “inflate or die syndrome”. Thus Denmark like Switzerland might end up realising that they are wasting their time and simply stop buying dollars to weaken their currency. The system of open markets/free trade that allowed crap from one country to come into another country and destroy the local producers and manufacturers was a stupid idea. We do not have time to get into this; conduct a basic search on the destruction caused by the free trade or the open market principle and you will understand why. There is nothing free because the concept of freedom cannot exist if you are blatantly manipulating your currency to get an edge. The current free trade system is like allowing an invasive alien, dangerous species into your ecosystem and then trying to determine what the harmful effects will be; by the time you do determine that the alien life is dangerous, a large percentage of the eco system will have been destroyed. The function of any government should be to protect its people, and everything else should be secondary. Today governments do everything in their power to destroy their citizens. After half a decade of growing ever sleepier, the currency market has started the year with its most volatile period since 2011. As the victims of the Swiss franc detonation lick their wounds, Denmark is battling to avoid its krone becoming the next victim of the global currency wars, wielding a combination of negative interest rates plus market interventions to sell its currency plus scrapping government bond sales as it defends its peg to the euro. I’ve seen this movie before; it never ends well. Denmark sprang a rate-cut surprise last week; the central bank will now charge you 0.5 percent for the privilege of having kroner on deposit. The bank’s third easing in less than two weeks came after it spent as much as 100 billion kroner ($15 billion) this month trying to weaken its currency, according to estimates by Scandinavian lender Svenska Handelsbanken. Taking on traders is an expensive business. The currency wars are moving from the covert operations to overt operations; this means currency markets are going to go wild and the most destructive phase of the wars is now about to begin. The definition of the word pain will soon take on a new meaning. 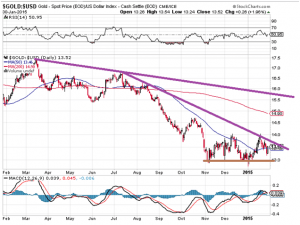 The other surprise move was the fact the Gold continued to rally higher in the face of a very strong dollar. This again signals that big changes are coming and that the dollars days are indeed numbered. For now, the outlook favours a strong dollar, but alliances are already being made that will (not might or May) dethrone the dollars top dog status sooner than later. The war with Russia is nothing, but a currency war in disguise. 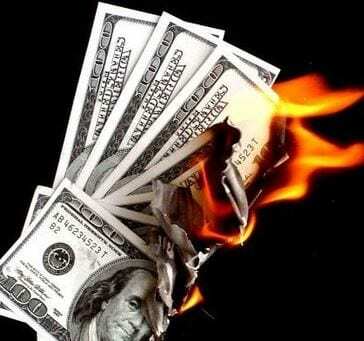 Russia was and still is one of the prime countries challenging the role of the dollar as the world’s reserve currency. Without this unfair status, the USA would be facing the same situation Greece is facing if not worse. One can clearly see that Gold has started to show signs of strength this year. It appears to have put in a bottom in 2015. There is strong resistance in the 15.80-16.00 ranges. A monthly close above these levels would indicate that the worst is behind Gold. 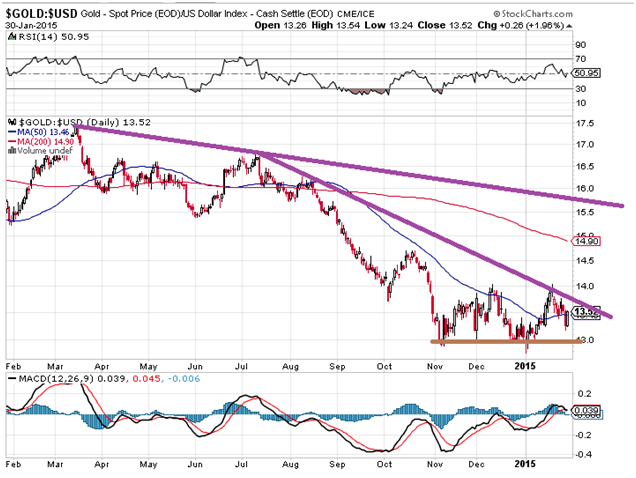 Consequently, a close weekly close below 12.90 would suggest that Gold bullion is still not out of the woods. The Race to the Bottom gains steam, as a nation after nations, devalues its currency to gain a competitive edge. As the intent is to gain a competitive edge, the race will not stop until a massive currency crisis unfolds; only then will the race come to a grinding halt.